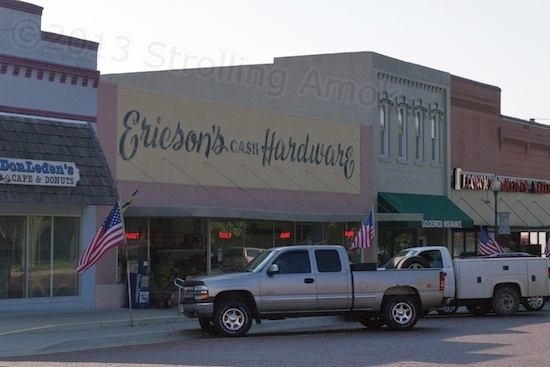 Like the peculiar name spellings, Stromsburg is an unusual town. Even the company that laid in some sidewalk similarly scrawled their name into an end panel. 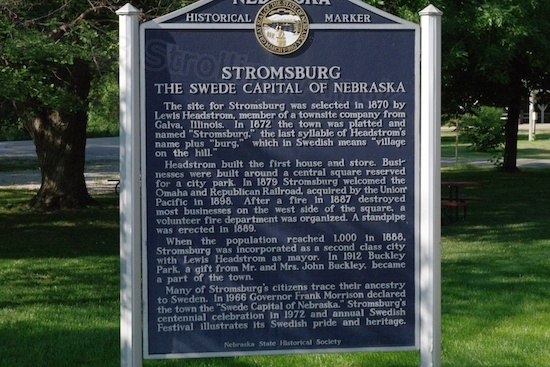 Stromsburg today has about the same population it did when it crossed into the big time in 1888 at 1,000 people. 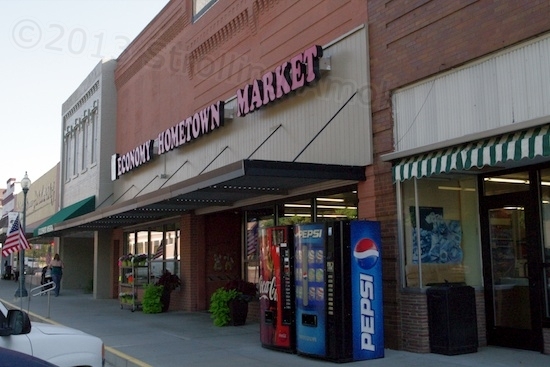 It is reportedly the largest of four towns in the county. 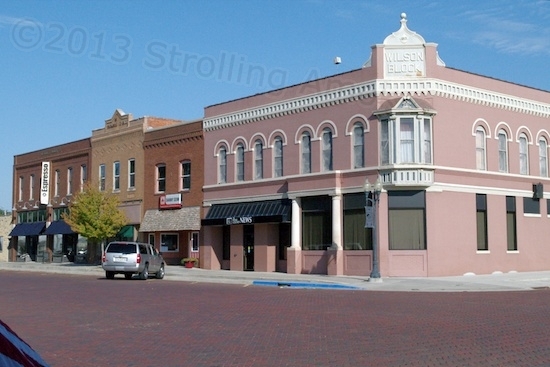 Want to see what a small town looks like without Walgreens and McDonalds and Wal-Marts? It looks clean, cohesive, and still has people standing about the sidewalks talking. Everyone except the farmers lives right in town and walks to where they need to go. Women walking strollers abound. The postal clerk knows everybody by name. As a tourist in the stores, you are instantly recognized as such, in kind of a “Oh! That’s odd. I don’t know you!” kind of way. Yes, it loses a lot of its young people, and has trimmed its population slightly in the last decade, but I can tell you, it still has plenty of suds compared to some of the rural towns in Illinois and Wisconsin that show whole blocks of abandoned storefronts and look like the zombie apocalypse already came and went years ago. For such a small town, it’s still a happening place, possibly from the influence of being “Nebraska’s Swede Capital”. Its business district is one block square, and that’s about it. Residential housing surrounds it several blocks deep. Neither of the two 70s-plus employees at the hardware store even know how old it is, and one has been working there 57 years. It displays washers and dryers as well as the usual hardware fare. The town square is surrounded by brick-paved streets, and all of the businesses are clustered there and along the highway through town. 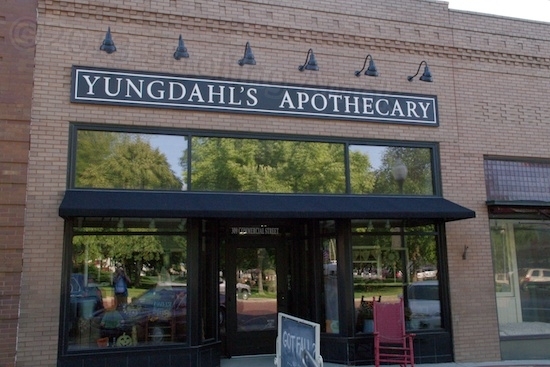 This is one of the few non-chain drug stores still in existence, and it looks to be doing fine. And this is where you buy your groceries. It also sells Cougar T-shirts for the local high school football team. 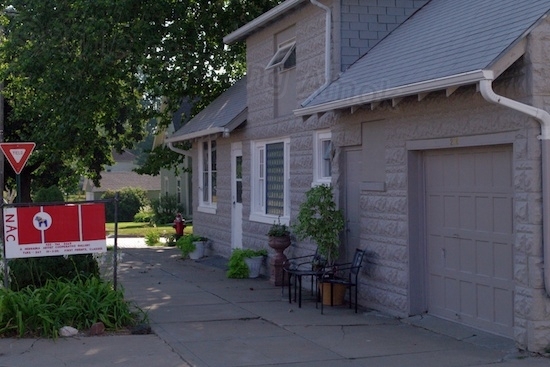 The Nebraska Artist Cooperative Gallery, just off the square, offers classes. 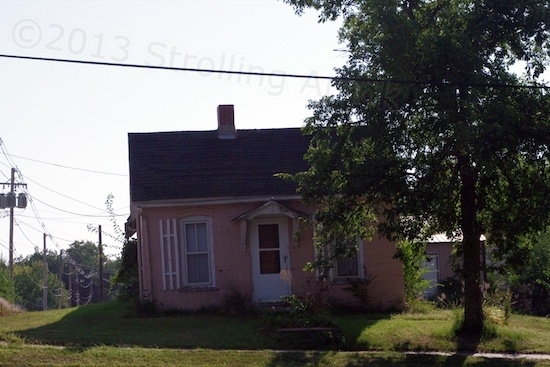 This tiny brick home on the outskirts of town (a few hundred yards from the square) looks like its foundation is listing heavily to port, because it is. But notice how straight the roof’s peak remains? I saw no other run-down or distressed houses in town. This is it. 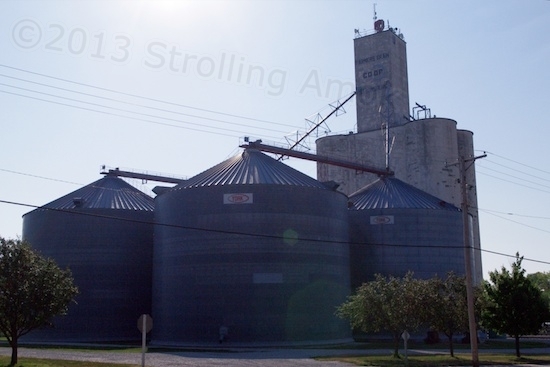 The grain co-op points to what rural living centers on around here. This plaque at the campground entrance to Buckley Park summarizes the beginnings of Stromsburg, which was created by a development company from Illinois in the same way that housing developments are started today. A town development company? Things were sure different back then! Well, the marker calls it “a townsite company” of which Lewis Headstrom was a member. The town was platted out in 1870, and Headstrom built the first house and store. When it was incorporated in 1888, he became mayor. It must have been quite an undertaking to market the thing and encourage people to move there. Wrong town, Chris! But it ain’t that far away in the sense of timelessness here. Instead of Andy’s “Hey” I think he’d be saying “Yah, sure” here. What a jewel of a town you’ve stumbled on. Thanks for telling us about it. My pleasure! Nearly half-a-dozen RVers have wandered in, but not too many go this way unless they’re commuting east-west on I-80 to get somewhere else. With the town center just a short walk from Buckley Park, this campsite is a real find. If only you had checked if they had nice $10,000 houses for sale with low property taxes, that would be a great place to retire when one is ready to give up the old RV lifestyle. Well Jerry, the reason I hadn’t checked is that going back to sticks-‘n-bricks is about the last thing on my mind. When it does occur to me, I ask myself “What are the winters and summers like here?” That knocks out a lot of otherwise nice places. When I can no longer heft a solar panel, most likely I won’t be able to hoist a snow shovel, either!